Our Member Information file provides a single point of access to record or view demographic data and historical financial and statistical history. 1,000 active members or Unlimited members allowed depending on license purchase. Extensive demographic detail retained for each member. Easy member lookup by name. Member Lookup - Display Active Members only or In-Active lookup. Enter Membership Fee detail for additional items such as locker fees, towel rental, etc. Payment Detail lines can be charged to different accounts and/or use different payment schedules. Picture Capture/Import of member picture. Complete Audit of all Field changes. Membership Hold with reduced payment and history. Link family members to head of family. Unlimited Notes History retained for each member. Store encrypted Bank and Credit card information using des3 encryption. Assign Passwords to sensitive information areas and fields. Select Payment frequency (Monthly, By-Weekly, Weekly, Quarterly, Annual, etc). Send Emails or Text Messages direct from Member file. Separate Count Down for such things as personal Training, Massage, Tanning, etc. Bar Code ID may be 20 Alpha/Numeric characters. Maintain Guest/Prospect data for promotional purposes. Private member messages on Sign In. Import New Client information from Web generated transaction file. Control Access and Record member visits. Choose Control Desk Sign In or Member Kiosk(Monitor faces member) Sign In. Display your own club banner at the top of these Sign In screens. Dual Monitors are fully supported for Sign In when used with a Serial Scanner, Serial Keypad, Finger Print and Proximity Reader. Sign In Messages may be modified and/or changed to any language. Optionally record visits using a Telephone Number and Numeric Keypad. User defined Time of Day and Day of Week Access Control. Use a Bar Code Scanner and your own Bar Coded Key Tags or print Membership Cards with Bar Codes from the Fitness Software. On Screen Numeric Keypad for use with Touch Screen monitors. Display members' name and picture for better security. Show alert messages for Payments Due, Measurements Due, Contract Expiry, Birthday Messages, Global Messages and Private Messages. Automatically display Birthday messages for your members. Alert messages may be assigned a unique sound to draw member and staff attention. Custom Sounds and text to voice supported for sign in alerts. Complete Visit History retained for each member. Control 24 hour access through a Security Door (standard serial port connection). Record visit notes for each visit. In-house Activity and alert display with current visit average and thumbnail picture. Launch Sign-In Screen only on second work station. Optionally display Contract Expiry on Sign-In screen and pre-alert 30 days prior to expiry. Record Staff shifts on same Sign In screen. Optionally Capture Sign Out time for members. Complete history of all Measurement Data. Create multiple Graphical Charts and report of member measurements. Calculates BMI and BMR for all measurement history. Record Blood Pressure and Heart Rate history with graphs. Six user definable fields may be used for any statistic and/or measurement. Form print makes recording new measurements easier. Record measurements for both left and right Thighs, Calves and Arms. Alerts sounded on Sign In and on Measurement Alert Report when member measurements are due. Post one set of measurements per day. Print measurement Graphs for your member. 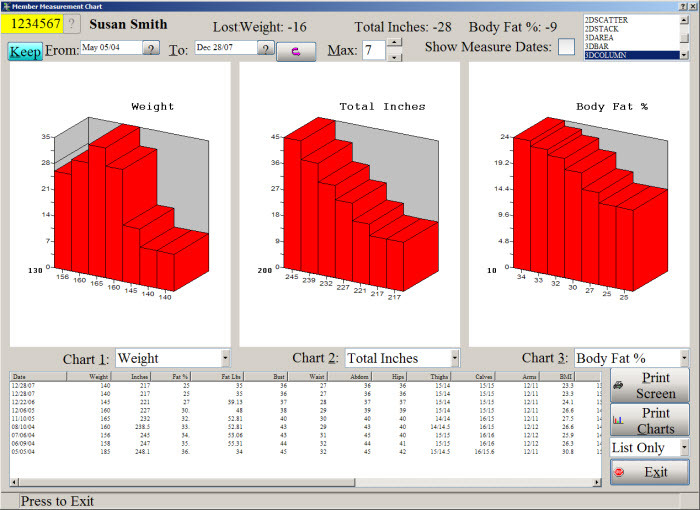 Graphs show progress of any three patameters such a Weight, Inches and Body Fat. Show Graphs over time or absolute amounts. 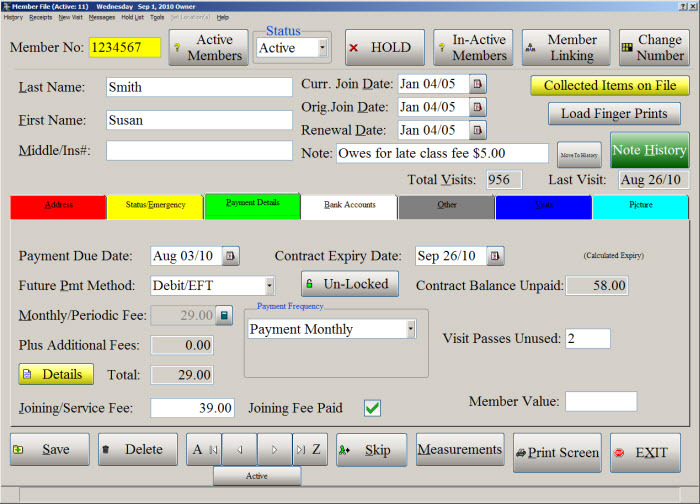 Full Point of Sale entry screen with 420 color coded buttons. Products may be assigned to a button or scanned using UPC code or custom product code. Record partial payments with balance going to collection file for follow up. Record and print Receipts for membership fees and/or product sales. Complete receipt history detail for Daily, Weekly, Monthly, Quarterly or Annual reporting. Print receipts to regular Ink Jet or Laser printers or to "Point of Sale" printers with cash drawer. Option to collect payment through members bank account. Multiple lines on each receipt. Multiple Payment methods on one receipt. Automatic Payment Date Advance for Membership Payments. Print Single or Duplicate Receipts. Print user defined Text/Liability Waiver on Receipt. Email Receipt in PDF format. 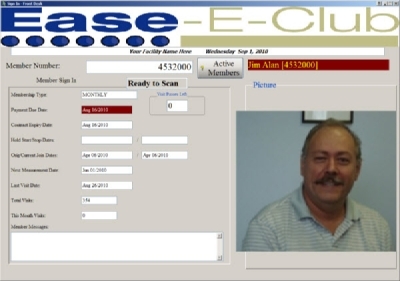 Create batch files for Bank Deposit and/or Credit Card all pre-authorized membership payments that are due. Export to 30+ different formats including ACH, NACHA, AUTHORIZE.NET and all Canadian Banks. Print Check Drafts through CheckWriter software without re-posting. Choose your own payment processor and save money. We charge no extra fees for this export utility. Creates receipts and advances payment due date automatically. Use the Bank Export utility to just create receipts and advance payment due dates. Bank Export Alert messages detect when credit cards have expired or accounts are invalid. Automatically include "Charge" receipts from POS posting. Automatically include previous NSF collections. Allow Staff/Employees to sign in and out using their Staff Code, Telephone Number or Bar Code. Use a Bar Code Scanner and your own Bar Coded Key Tags or print Staff Cards with Bar Codes from the Fitness Software. Optionally assign a PIN # password to each staff member that must be entered when they sign in. Show messages for Global and Private Messages from their supervisor. Staff may also send messages to their supervisor. Complete Payroll Shift History retained for each staff member. A Payroll Time Card maintenance program allows correction and additions to any time card record by an uuthorized supervisor. A Payroll Report provides detail and/or summary information for posting to an external payroll system. Outstanding Staff lookup shows if any staff have forgotten to Sign In or Out. Over 30 pre-programmed reports and user defined Excel export. All reports can be PRINTED, VIEWED OR EXPORTED TO EXCEL, TEXT, PDF OR HTML. Daily receipts report sorted by Payment Method, Date, Staff Code or Product Code for any selected range of dates. Export selected MEMBER data to an Excel Spreadsheet for custom reporting and Mail Merge purposes. Print alert reports for Measurements, Birthdays, Contract Expiry, Payment Due and Credit Card Expiry Dates. Control reports for Revenue/Deposit Balancing, Staff Commissions, Low Stock Re-Order and Product Sales. Monthly "Operations Analysis Sheet" report provides financial and statistical reporting and analysis. A Winners Report prints a list of members losing the most weight/Inches in a selected month. Activity/Visit History reports with hourly visit analysis. Milestone visit reporting for over 100, 200, etc visits. Audit History report or Member File changes. Staff Commissions report with user defined setup. End Of Day setup allows flags for weekly, End of Month, 15 of Month or Day of Week. A "No Show" member report provides alert of members not attending. Staff Products Sold report - resorts the cash receipt report by Staff member. Print Membership Cards with optional pictures and bar codes. May be printed to Business Card stock or Plastic Card Printer. Sort Visit History and/or Membership report by Gender. An optional "Report Writer" is available at a small additional fee. Most client do not require this option. Any checks or credit card charges that get returned as NSF or some other reason may be entered into a Collection module for follow up. May also be used to record returned or cancelled merchandise and/or receipts. Proper accounting treatment for NSF charges and client fees are accomodated. Collection notes can be maintained showing a history of collection efforts. NSF letters and emails may be generated when needed. Follow up dates remind staff to act upon each item when it is due. Collection and receipting is provided with proper handling of additional NSF and user fees. Enhance member communications and increase retention. A Communication Manager allows form letters, contracts and emails to be sent to selected groups of members based on user selected criteria such as Contract Expiry, New Member Welcome, We Missed You, Birthday Greetings, NSF Letter, etc. Notices may be custom built based on existing templates or designed from scratch. Insert over 30 different Client file fields for powerful mail merge options. Ability to filter by Membership Type, Staff Code, Active or In-Active and selected members. Address Labels may be printed for form letters or post cards. Mass email with attachments may be sent. Export selected data to an Excel Spreadsheet for custom reporting and Mail Merge purposes. This is an excellent tool for prospecting previous members and for retention management. May be used to contact Prospect in the Guest category. Mass Emails may be sent to one or both email addresses. Product table provides an unlimited inventory of products and/or membership fees to be defined. Access all Product codes through the Receipt Entry or POS entry screens. Product Inventory controls Stock On Hand, Point of Sale, Pricing, Re-Order levels and Suppliers. A re-order report provides an alert to re order low stock items or just list the value of existing stock. A product sales report provides an annual sales analysis by product or by Sales Category. A Product Sales monthly summary provides trend analysis by month for each items or category. All posted or generated receipts (Revenue Transactions) may be updated to an external accounting application as a journal entry thus eliminating the need to manually post entries. Batch file formats for Quick Books, Simply Accounting and Vadim software are supported. The export file for Simply Accounting is a simple TAB delimited text file that may be imported into any external General Ledger. The report produces two different reports; One sorted by Payment Method and the other sorted by Revenue Account. After update to a General Ledger each transaction is flagged to prevent updating twice. The System Control file allows user to customize the look and function of many screens and features. Set Facility details, Logo and Banner display, Tax Rates, Member Defaults, Sign In Defaults and Alerts, Passwords, Receipt defaults, Shifts, Commissions and Background screen images. Display your own Logo/Banner on the Main Menu and Sign-In Screens. Bi-Level Adjustable Tax rates and application. Set custom messages for Sign-In alerts. May be changed for language preference. Select user defined sounds to associate with each alert message. User selectable phone formats for North America and Europe. Currency designation for Dollars( $ ), pounds( £ ), EURO( ? ) sign or any other currency. Password selection for protection of critical member information. User defined Date format and Location settings accommodate USA, Canadian and international preferences. Set default commission rates and rules. Define access for security doors and scanners. Define how the system handle many of the member policies such as automatically making members In-Active when their contract expires. Define COM PORT settings for Sign-In scanners and security doors. Define Email settings for mass emails sent through the Communications Manager. Setup Receipt parameters for Point of Sale printers and cash drawers. Setup shift times and days for receipt control. Setup various tables for Membership Types, Product Codes, Bank Codes, Payment Types, Staff Names, Visit Types, User Accounts, Location Codes, Access Times and In-Active Reason Codes. Custom program changes accommodated through a "Fee for Service". Many suggested enhancements are added to our development list and included free of charge in a later release. Support is provided immediately during regular business hours. After hours calls are forwarded to Cell Phone support personal or are collected by a message center. Email support is monitored and responded to after hours and on weekends.